Group Wholesale Banking helps companies and institutions optimise their business operations and cash flow, manage risks, expand into new markets and manage their capital needs by providing tailored financial solutions, services and sector insights. We develop trusted partnerships by focusing on our clients’ long-term interests and helping them meet their strategic objectives. Our unique combination of local, in-country presence and expertise, astute Asian market insights and regional network connectivity enables us to help unlock Asia’s potential for our clients. Named Best Transaction Bank in Singapore at The Asian Banker Transaction Banking Awards 2017, and received more than 20 other industry awards across the region in recognition of our Transaction Banking capabilities. The global economy in 2017 experienced the broadest-based improvement since 2010. However, depressed commodity prices, particularly those of oil and gas, dampened regional economic growth which impacted the performance of companies across Asia. Despite continued macroeconomic challenges which affected our lending revenue streams, we recorded a year-on-year increase of 0.6 per cent in total revenue in 2017. This was attributed to the 8.8 per cent rise in non-loan revenue on the back of the strong performance of our cash management and trade finance businesses and Global Markets activities, which saw growth of 10.4 per cent, 13.7 per cent and 5.1 per cent respectively. During the year, we also saw strong year-on-year performance by our Global Financial Institutions Group and Structured Trade Commodity Finance segments, and moderate revenue growth in our Commercial Banking business. In 2017, we continued to accelerate the investments in our product and digital capabilities to develop a sharper competitive edge in cash management, trade finance and supply chain solutions, and to offer our clients seamless access to our Global Markets solutions. Across the region, we also remained focused on building up our client coverage teams in our key markets and sharpening our industry-specific expertise by setting up dedicated Sector Solutions teams to provide tailored solutions to our clients. As a result of our investments and efforts, we increased our rate of new client acquisitions and diversified our revenue sources in 2017. We stayed disciplined in our expenses across the region, with a 6.9 per cent increase year on year in operating expenses. While net profit before tax in 2017 was impacted by increased allowances for credit losses, our underlying portfolio remained strong with our revenue streams demonstrating strong growth rates. The global economic recovery is expected to maintain its momentum in 2018 with a more positive growth outlook for Asia. We continue to be encouraged by Asia’s long-term prospects anchored by economic stability in China. We also remain optimistic about ASEAN’s growth prospects, underpinned by its vast and growing consumer market, substantial intra-regional trade volume and continued investment flows. Trade and investments flows in ASEAN are also set to benefit significantly from the China-led BRI, which will continue to open up business opportunities and to drive increased regional connectivity. To help more companies expanding from China into ASEAN and vice versa, in November 2017 we opened our Kunming Branch in Yunnan, the third UOB branch in West China, to offer both onshore and offshore financial solutions in support of our clients. UOB’s unique combination of scale and expertise in local markets and our regional network capabilities enables us to support our clients in realising their long-term growth aspirations as they grow and expand throughout Asia. To partner our clients in their expansion as they seize the opportunities arising from multilateral economic initiatives and the region’s growing consumption demand, we will continue to deepen our cross-border product capabilities in Transaction Banking and Global Markets instruments. We will also continue with our investments to sharpen our edge and expertise across the predominant industries in Asia to provide integrated solutions that address our clients’ business requirements and challenges. Our Commercial Banking teams are dedicated to supporting UOB’s medium-sized clients by providing a full suite of Wholesale Banking solutions to help them achieve their business objectives. As their preferred banking partner, UOB’s products and services are developed in accordance with and customised to our clients’ needs as they manage and grow their businesses within and across borders. One area of focus is on helping companies grow and improve their business efficiency through simple, quick and effective means by harnessing technology. This is why we work with financial technology (FinTech) partners to provide solutions that drive enterprise productivity and growth. In 2017, we collaborated with Nufin Data Pte Ltd on NEMOᵀᴹ, their cloud-based supply chain financing solution that helps companies digitalise their back-office processes while also enabling quick access to financing options. In the same year, we launched Southeast Asia’s first virtual accounts payable solution, the UOB Virtual Payment Solutions suite, to help our clients use technology to overcome their business challenges. The UOB Virtual Payment Solutions suite enables companies to pay their vendors and suppliers through a virtual corporate credit card account even if these parties do not accept card payments. The UOB Virtual Payment Solutions suite also lessens companies’ dependence on manual processing as it automates the account reconciliation process, minimising human error and freeing up resources for other areas of operations. As our clients expand across Asia, they look for a banking partner that has the regional presence and experience to connect them to business and investment opportunities. Our FDI Advisory Unit, which was established in 2011, has been at the forefront of helping our clients seize such opportunities. Through our nine FDI Centres located in China, Hong Kong, India, Indonesia, Malaysia, Myanmar, Singapore, Thailand and Vietnam, we actively promote regional connectivity in the areas of trade, finance and logistics by working closely with government agencies, trade and industry associations and professional service providers. 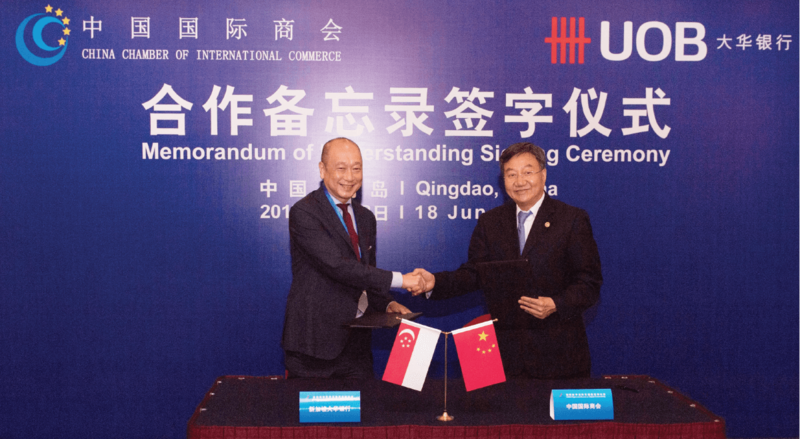 The Memorandum of Understanding (MOU) with CCOIC builds on UOB’s existing efforts in facilitating Chinese business investment in Southeast Asia. In 2017, we signed an MOU with the China Chamber of International Commerce (CCOIC), China’s national business association, to deepen our support of Chinese companies expanding through the BRI into the region. The agreement with CCOIC is an extension of UOB’s longstanding partnership with the China Council for the Promotion of International Trade (CCPIT). UOB was the first and only bank in ASEAN to enter into MOUs with both CCPIT and CCOIC. Through the CCOIC-UOB collaboration, Chinese companies represented by the CCOIC can access UOB’s comprehensive suite of local and cross-border solutions, as well as the ecosystem of strategic partners across the Bank’s Southeast Asian network. Both parties will also facilitate UOB’s regional clients’ projects and businesses in China. In 2017, we also stepped up our efforts in Europe with the development of a UK-ASEAN corridor initiative, in which we work with like-minded partners and government agencies to facilitate trade and investment flows proactively. Harnessing the strengths of UOB’s extensive network, over the last six years we have provided our FDI Advisory services to more than 1,600 companies from around the world in their expansion into Asia and facilitated capital flows of close to $90 billion into the region. We continue to support entrepreneurship by extending venture debt financing to high-growth and innovative start-ups in Asia through InnoVen Capital, our joint venture with Temasek Holdings. Since the joint venture was set up in 2015, InnoVen Capital has funded more than 20 promising companies across Southeast Asia including Singapore, Indonesia, Malaysia, Myanmar and Thailand. Tapping InnoVen Capital’s expertise in assessing the business potential of start-ups and complementing its offering, we also extend additional funding under the SPRING Venture Debt Programme to Singapore-based start-ups, typically for the purchase of technology-related assets. Outside Singapore, UOB also collaborates with InnoVen Capital to provide financing to its portfolio companies in countries such as Malaysia and China. Following the setup of InnoVen Capital’s office in Beijing in 2017, we will be able to help accelerate the commercial viability of more Chinese start-ups without them having to pledge additional collateral or to dilute their stakeholdings. InnoVen Capital has also invested in a number of technology start-ups in India, several of which have seen significant growth and have begun entering Southeast Asian markets backed by InnoVen Capital’s cross-border financing support. Our Corporate Banking client teams specialise in serving large Asian corporations as well as North American and European multinational corporations (MNC) operating in Asia. We tap our strong regional network, deep in-market insights and our local and regional expertise to provide them with integrated financial solutions. We are distinctive in meeting the local, cross-border and multiple-market needs of our large corporate clients. We provide regionally-integrated, multiple-product solutions in cash management, trade finance, financial supply chain management, treasury and investments in fixed income, currencies and commodities, as well as capital market advisory services. In 2017, we continued to create value for our clients by supporting their business needs. For example, UOB was the sole financial adviser and sole acquisition finance provider for one of the largest public market takeovers in Singapore – the acquisition of United Engineers Limited and WBL Corporation Limited by Perennial Real Estate Holdings Limited. We were also the joint bookrunner and underwriter for NetLink NBN Trust’s initial public offering (IPO), the largest Singapore Exchange Mainboard IPO since 2011, which received the Best IPO, Singapore award at The Asset Triple A Country Awards 2017. During the year, we also developed new client relationships as we helped large-sized companies meet their working capital requirements and market hedging needs. This included the provision of banking solutions to help the subsidiaries of our existing clients meet their financial needs as they expanded across Asia. We continued to explore opportunities to collaborate with our existing clients and to assist them in their digitalisation efforts to ensure the future-readiness of their business. We also enhanced our client coverage of the various corporate segments across Asia. The Structured Trade and Commodity Finance teams support and complement our clients in the commodity value chain through the provision of trade finance structures ranging from pre-export, shipment sales, inventory and borrowing base and receivables financing. In 2017, the global commodity market recovered from prolonged low prices, leading to the increase in cross-border trade opportunities. We remained prudent in managing our clients’ commodity risk exposure and capitalised on the Bank’s strong network franchise to nurture new and existing client relationships. We also tapped strategic bilateral relationships to facilitate an increase in trade volumes among our clients and to support their regional expansion plans, which in turn enabled us to achieve revenue growth. During the year, we also intensified our cross-functional and regional collaboration efforts with our product partners to help our clients achieve working capital efficiencies and improve their risk management. This was done by providing them with cross-border cash management solutions and hedging solutions across commodities and derivatives. Our Global Financial Institutions Group combines our local market knowledge and regional expertise to support our Financial Institution clients which include banks, non-bank financial institutions (central banks, diversified financial, public sector, insurers and real money funds), global property funds and financial sponsors. We help them to grow their business and to drive their profits across Asia and the gateway cities in Australia, US and UK by offering comprehensive solutions in cash management, trade financing, interest rate and currency derivatives, hedging, specialised finance structures and capital markets. Our commitment to creating value for our clients has enabled us to establish ourselves as a trusted partner for their regional business. To serve the strategic needs of our clients better, since 2015 our team of more than 100 dedicated, sector-specific coverage bankers and analysts across UOB’s global network has been strengthening our coverage of this client segment. In 2017, we successfully grew our client portfolio and deepened our existing partnerships with leading financial institutions. This enabled us to achieve healthy revenue growth of 15.7 per cent for the year. Tapping the strengths of UOB’s extensive network, credit ratings and product partners, we offer solutions ranging from bullion and commodities, secured financing and bank risk trade financing to cash and liquidity management and global funds origination. During the year, we continued to build on our capabilities, with our specialised client coverage team working with various product partners to provide customised and distinctive financial solutions to meet the risk management needs of our Financial Institution clients. We have also established our capabilities in structured finance origination across the capital structure spectrum, from debt and equity to hybrid security and financial derivatives, to drive targeted client origination opportunities across the UOB franchise. In addition to the suite of core solutions from Global Markets, Transaction Banking and Investment Banking, in 2017 we helped our financial institution clients to optimise their capital and liquidity positions. In doing so, we assisted them in managing market risks against the backdrop of continued market volatility and potential disruption by emerging FinTech players. With immense business opportunities arising from the BRI, Greater China remained as one of our market priorities with structured finance and infrastructure financing among our key focus areas. Group Transaction Banking is focused on developing financial solutions in cash management, trade finance and financial supply chain management to help our clients optimise their business operations and cash flow, and enhance working capital efficiencies. To support the increasing internationalisation of our clients’ businesses, we have in place experienced teams of cash and trade product specialists in China, Hong Kong, Indonesia, Malaysia, Myanmar, Singapore, Taiwan, Thailand and Vietnam. Our regional operating model also ensures that we capitalise on the strengths of our existing in-market franchise to provide our clients with seamless, integrated and borderless expertise and solutions. In 2017, we enhanced our financial supply chain management capabilities across Asia, helping our clients to connect efficiently with their supply chain strategic partners. This was done by streamlining our credit evaluation framework and through a disciplined onboarding model, enabling us to address working capital gaps of key counterparties for our MNC and large corporate clients. As a result of our stronger client engagement, the revenue contribution from our financial supply chain management business more than doubled for the year. During the year, we also launched a range of liquidity management solutions that helped large corporates to achieve greater levels of self-funding and to enhance their interest earnings, which in turn improved their treasury management. For example, our regional multi-currency interest optimisation solution assists our clients in improving the yield on their cash holdings across various entities and locations without the physical movement of funds. Through the implementation of this scalable solution, we enabled our clients to enhance the returns on their operating funds without affecting the efficiencies of their entities’ day-to-day operations. As a result of our sustained efforts in helping our clients meet their needs and overcome their challenges, our overall revenue grew strongly by 10.3 per cent year on year, driven by a 13.7 per cent increase in our trade income that included strong growth in the Financial Institutions segment. We also recorded a 10.4 per cent growth in cash management revenue, attributed to a positive performance by our Singapore dollar clearing business and continued development of our regional capabilities. Group Transaction Banking contributed to more than a third of Group Wholesale Banking’s total revenue in 2017. We received 23 industry awards across Asia in recognition of our competitive and customer-centric product offerings, our highly competent cash and trade product specialists and the constructive collaborations we have with our clients. These awards included Best Transaction Bank, Best Cash Management Bank and Best Trade Finance Bank in Singapore at The Asian Banker Transaction Banking Awards 2017, Best Bank in Singapore at the Asiamoney Cash Management Client Satisfaction Awards 2017 and Best Cash Manager in Singapore in the Euromoney Cash Management Survey 2017, as ranked by corporates and non-bank financial institutions. We also received multiple awards for our cash management, treasury, working capital, supply chain finance and structured trade solutions across our Southeast Asian markets. Group Investment Banking focuses on providing investment banking solutions across debt and equity capital markets and event-driven services in areas such as corporate finance, mergers and acquisitions, leveraged finance, project finance and specialised finance. This multi-product focus enables us to structure solutions that are customised to Group Wholesale Banking clients’ financing and corporate advisory needs. In 2017, UOB led several landmark event-driven transactions and improved our market share of flow products, such as syndicated loan and fixed income. In addition to our support of the acquisition of and mandatory cash offer for United Engineers Limited and WBL Corporation Limited, we acted as the sole financial adviser and acquisition finance provider to Respond Logistics Pte Ltd for its $275 million acquisition of Poh Tiong Choon Logistics Limited. In Thailand, UOB also acted as financial adviser and mandated lead arranger to TOA Venture Holding Company Limited on its tender offer for the securities of Sherwood Chemicals listed on the Stock Exchange of Thailand. During the year, we remained one of the top mandated lead arrangers for debt capital markets (DCM) syndicated loans in Asia (excluding Japan and Australia). In 2017, we were ranked first in Singapore on Bloomberg’s Singapore Borrower Loans Mandated Lead Arranger League Table with 33 transactions, and third in Southeast Asia with 49 transactions. Our landmark syndicated loan deals in Singapore also included the $600 million term loan facility for Suntec REIT, $420 million refinancing term loan facility for Savu Investments Ltd and $900 million term loan facility for LN Development (Stirling) Pte Ltd.
We also capitalised on UOB’s regional network and cross-border capabilities to arrange several significant financing transactions. These included a US$500 million term loan facility for PT Bank Negara Indonesia (Persero) Tbk, US$200 million revolving credit facility for PT Tower Bersama Group, NT$2.3 billion term loan facility for Wei Chuan Foods Corporation, HK$3.1 billion refinancing for China Mengniu Dairy Company Limited, HK$1.8 billion term loan facility for CSI Properties, US$579 million and RMB900 million acquisition term loan facilities for a portfolio company of Gaw Capital, US$1.5 billion revolving credit facility for Vitol Asia Pte. Ltd., and a A$569 million term and revolving credit facility for Gallop Finance Pty. Ltd, a portfolio company of Blackstone Real Estate. UOB received recognition as both the issuer and dealmaker for our bond issuances at The Asset Triple A Country Awards 2017. In 2017, our DCM Fixed Income team executed more than 100 bond transactions, including private placements, across Asia and reinforced our position as a leading regional player in local currency fixed income across Singapore, Malaysia and Thailand. In the Singapore dollar bond market, we lead-managed four of the six largest deals in 2017, including HSBC’s S$1.0 billion perpetual non-call five-year Basel III-compliant Additional Tier 1 capital securities, Housing & Development Board’s S$900 million five-year notes, Singapore Airlines Limited’s S$700 million eight-year notes and UOB’s S$750 million 12-year non-call seven-year Basel III-compliant Tier 2 capital securities. 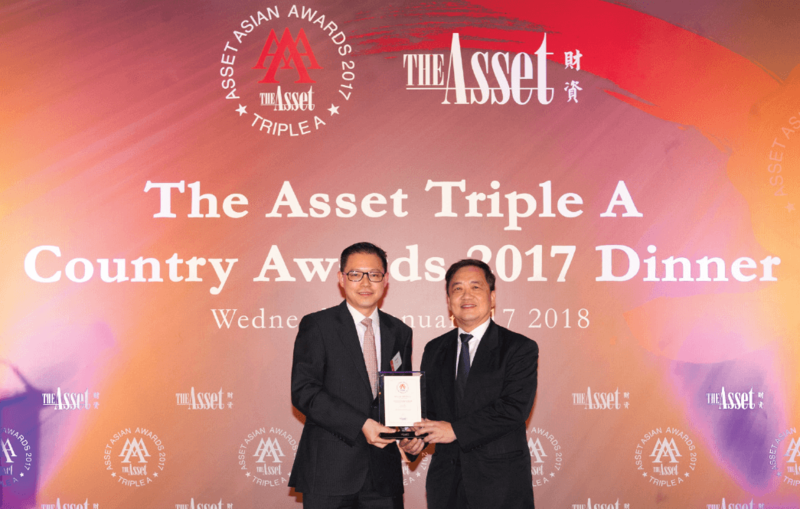 UOB’s successful issuance of the tightest-ever coupon and spread in Singapore dollar for a 12 non-call seven Basel III Tier 2 offering led to the Bank receiving two Best Bank Capital Bond, Singapore awards as the issuer and as joint lead manager at The Asset Triple A Country Awards 2017. We also received two Best Covered Bond, Singapore awards, as issuer and as joint bookrunner and lead manager, for UOB’s dual currency US$500 million and €500 million covered bonds which was Asia’s first dual currency covered bonds issuance. In addition, we lead-managed all six bank capital transactions in Singapore in 2017 and brought several foreign issuers to the Singapore dollar market. These included Commerzbank AG’s S$500 million 10-year non-call five-year Tier 2 notes, Landesbank Baden-Württemberg’s S$300 million 10-year non-call five-year Tier 2 notes and BNP Paribas SA’s S$250 million 7.5-year senior non-preferred notes. In the Malaysian ringgit corporate bond market, we arranged SkyWorldCapital’s RM50 million Musharakah programme and RM400 million Murabahah programme, which won the Structured Finance Deal of the Year at the Islamic Finance News Deals of the Year Awards. In the Thai baht corporate bond market, we executed several high profile deals, including Land & Houses Plc’s THB7.0 billion senior unsecured debentures, Pruksa Real Estate Plc’s THB5.0 billion senior unsecured debentures and UOB (Thai) Plc’s THB6.0 billion Tier 2 Basel III-compliant subordinated debentures.